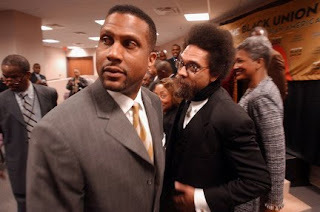 Other than the March Madness tournament this weekend, Tavis Smiley and others held his controversial "Black Agenda" summit in Chicago that was the subject of previous debate between Smiley and the Rev. Al Sharpton a few weeks ago (we blogged about it HERE). Among the Summit panelists were some of the regulars who we've all come to expect to be in attendance at Tavis' State of the Black Union (Dyson, West, etc.) which, incidentally, was canceled this year. The dialogue that took place raised many good points as to what and if a "Black Agenda" should be included by the President of the United States and the U.S. Government in general, but it also left many questions unanswered. Please join the members of the Urban Politco tonight as we tune in (and dial in!) to continue this dialogue about the "Black Agenga." Video of Tavis' Summit HERE.